I know roughly where it should be but it takes me a little wandering to find it. Suddenly I spy people with shopping coming my way – that must be it! I follow my nose down a small side street and spy the covered market. I’ve entered on the main walkway – it’s broad and doesn’t seem too crowded. Almost immediately I’m caught up by a local man who wants to show me around. ‘I’m not trying to sell you anything, what are you looking for? This street, all jewellery, to the left leather goods, to the right carpets, what are you looking for?’ Hüseyin pressed me for answers. ‘Where are you from? London? My cousin lives in London, he has a shop in North London. He’s English now!’ Extracting myself from this man’s helpfulness, and indeed, he wasn’t trying to sell me anything, I cut down a side alley to dive deeper into the Bazaar. I keep snapping with my camera and pause to look at some brightly coloured ceramic bowls, the type which I realise later, are common throughout. It seems to pause in this place is to illicit a conversation with a friendly local. It’s been too long since I’ve taken a walk through a market overseas and I’m out of the habit of the careful slow walk, not making eye contact in order to be undisturbed. It’s not a problem, it’s all very friendly. As I leave this stall to continue my amble I’m called over to Orhan’s carpet shop. Not deterred by my lack of willingness to purchase one of his many beautiful Turkish carpets, ‘how can you not want one, it’s part of our culture?’, I also leave with a dinner invitation for that evening. One which as a solo female traveller I’m unlikely to take up! As I wend my way deeper into the bazaar I move from Turkish carpets to ceramics to football shirts and take in all that it has to show me. The whole area is a riot of colour, lights and busyness. As the alleys take me deeper they narrow and so give the feel of a crowded, exotic market. 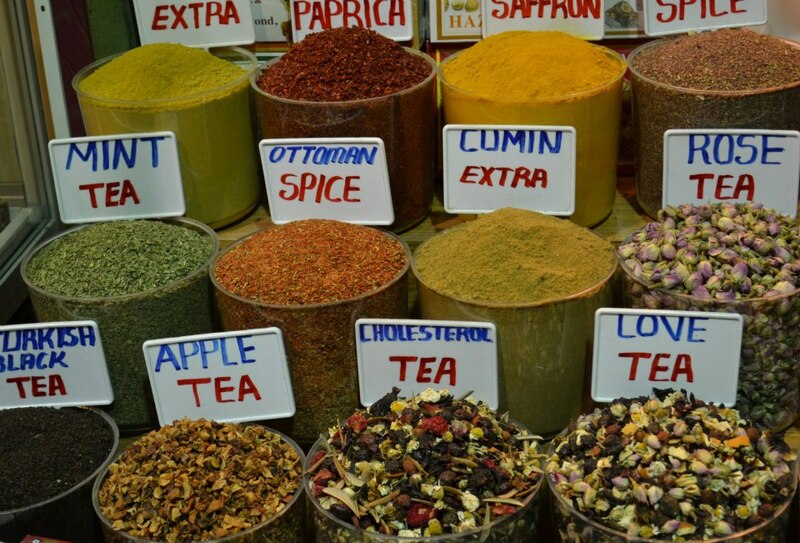 Some stalls have spices on sale and many different teas – including a ‘natural viagra’ tea and ‘love’ tea. Many are selling to tourists – you can hardly move in the Turkish Delight shops for young Americans trying to find the perfect exotic take home gift. Other shops with their football shirts and jeans clearly cater to a more local market. There are as many locals as tourists in this mishmash of cultures and people. I stop to buy just a couple of presents but mainly spend my time soaking it all in. 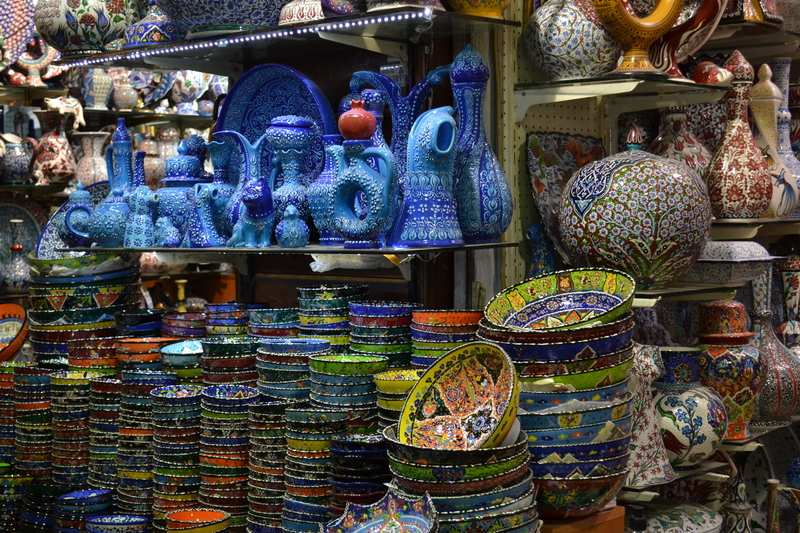 The Grand Bazaar in Istanbul is well worth a morning of your time. Look up as well as all around – many of the ceilings are brightly decorated in yellow and blue patterns in what I come to recognise as a Turkish style in many of the historic buildings of the city. For more information on the Grand Bazaar, including a map, how to get there and opening times click here. This entry was posted in Turkey and tagged grand bazaar, Grand Bazaar Istanbul, Istanbul, market, shopping, Tea, travel writing, Turkey, Turkish, Turkish carpet, writing on April 4, 2013 by Rachel. Quite something to see and very much recommended. This is a religious ceremony (called sema), not a performance and it’s very moving. The dervishes are from the Mevlevi order from a mystical branch of Islam. The dervishes rotate slowly, raising their arms with one palm turned up to God and the other facing palm down in a gesture that says they keep nothing for themselves. In total they whirl for around 20-30 minutes, in sets of around 5 minutes each. They do not employ the ‘spotting’ technique of dancers to prevent themselves getting dizzy but there’s not one whisper of staggering during the whole ceremony. They whirl silently in a trance like state as an act of worship, whilst accompanied by traditional worship music. This beautiful building was originally a church and later became a mosque. The original church on the site was built in AD 360 but was destroyed during riots. A second church built in AD 405 burnt down in a fire and parts of this can still be seen outside the current building. This is the third construction on the site, dating from AD 573. It was converted to a mosque in 1453, after Istanbul (still called Constantinople) was conquered by the Ottoman Empire. 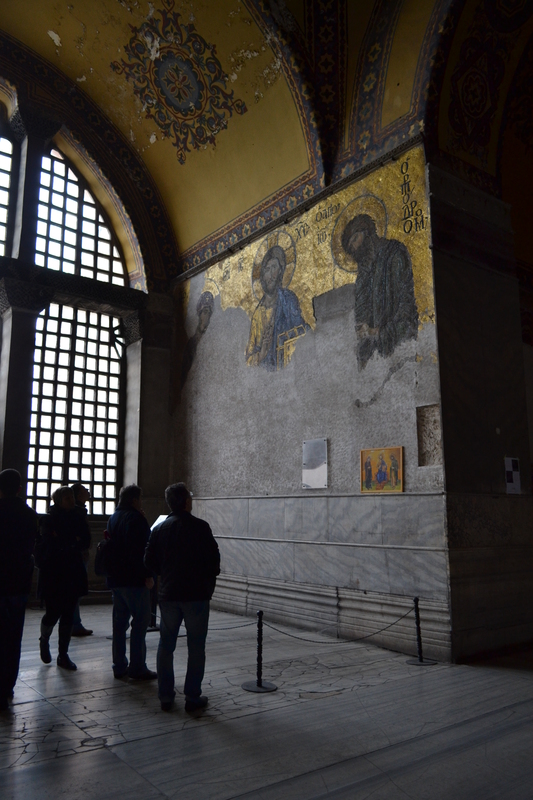 During the 1930s it was declared a museum and since then some restoration work in revealing the Christian mosaics on the walls has begun. There is a strange juxtaposition here between the Christian art and Islamic elements. It’s well worth a visit to see the mosaics, mainly on the upper gallery (although there are a couple on the ground level too), they are beautiful. Take a traditional Turkish bath. It’s quite an experience. The ladies took me in hand and I was instructed to ‘sit, relax’ very firmly! First you relax in a steam room on a central hot stone. You’re left for around 10-20 minutes and then your attendant will come over and scrub you like you’ve never been scrubbed before to remove old, dead skin. Once done they will give you a bubble wash and massage, then rinse you off. Following that you will be left to yourself again to relax in the jacuzzi or on the hot stone and rinse some more. It’s a very strange experience being washed like a child but I left feeling like new! This site is worth visiting for the Harem alone. It is covered, wall to wall in beautiful blue and white ceramic tiles. As you wander through the Queen Mother’s quarters you can sense the women of times past and what life might have been like between these walls. The Queen Mother would have run the Harem, making all key decisions. The only men allowed inside were eunuchs and the Sultan himself. You can still see the area where the eunuchs would have left food for the women to collect and the corridor where the Sultan reportedly dropped coins for the women to pick up. Charged with internal politics the harem was strictly ordered and hierarchical. The Queen Mother at the top, followed by the Sultans favorite concubines and then others followed in turn. 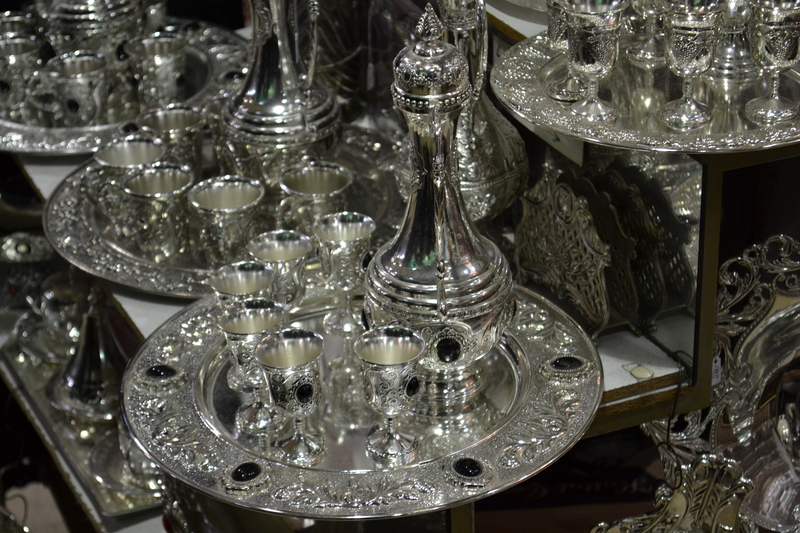 Many different items are on sale at the bazaar. Go prepared to haggle unless it’s marked as ‘fixed price’. The bazaar is an assault on the senses. Noise, brightly coloured trinkets, people calling to you, crowds jostling. 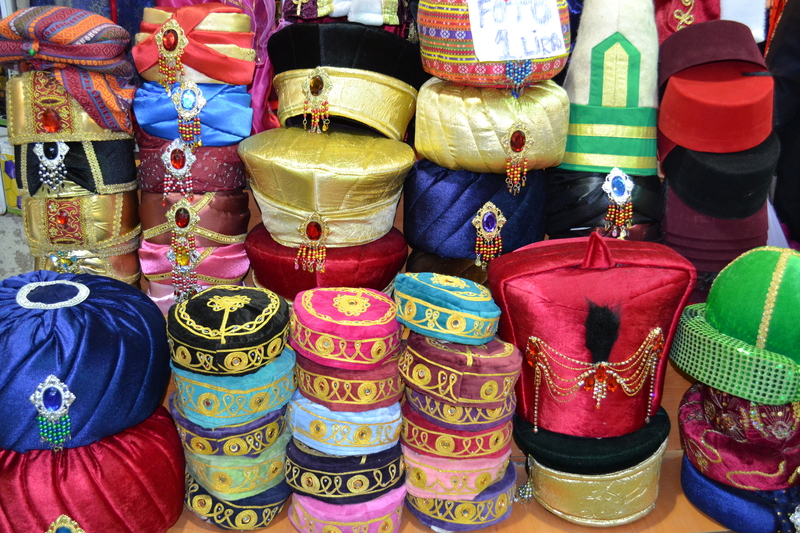 Items to purchase range from beads, ceramics, carpets, textiles, traditional musical instruments, Turkish Delight and, should you be so inclined a Fez. Go prepared for friendly banter and crowds, keep an eye on your valuables as you would in any city market; but all in all it’s a non-threatening and friendly place to spend some time. To book to see the Whirling Dervishes in Istanbul I went to http://www.hodjapasha.com. There is no photography allowed as it is a religious ceremony but it was good to put the camera away and just watch this mystical event. The Hodjapasha Centre also has shows of traditional dance from all over the region – belly dancing and folk dancing. I visited the Cemberlitas Hamami which is one of the oldest in Istanbul. It was very good. There are other Turkish baths in Istanbul but do check a review website like Trip Advisor before visiting as some have consistently poor reviews, with regards to attitudes to tourists in particular. 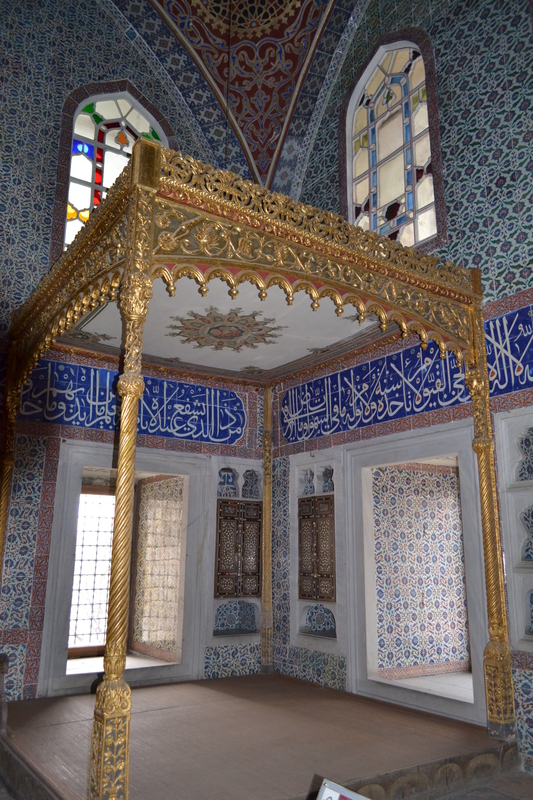 This entry was posted in Turkey and tagged Dervish, Grand Bazaar Istanbul, Hagia Sophia, Istanbul, Mevlevi, Mevlevi Order, Topkapı Palace, Turkey, Turkish bath, writing on April 4, 2013 by Rachel. Am I off on some epic safari, spanning numerous worlds, I hear you ask on reading the title of this post? Well no, not exactly, but a long weekend in Istanbul does mean I will be visiting two continents and back in the space of 4 days. The planning is well underway. Currency, Turkish Lira has been acquired, flights booked and a hotel secured; so that’s the basics done. I’ll be flying out just after lunch on Friday which, I hope will see me arrive, well rested, in time for some delicious near eastern food. I’ve decided to soak up plenty of culture on this trip, so I will be watching dervishes whirl and bellys dance. Of course I can’t possibly turn down the opportunity for a Turkish bath and massage whilst I’m there. This leaves me the rest of my trip to squeeze in as many churches, mosques and meals as I can! It will be an adventure no doubt! 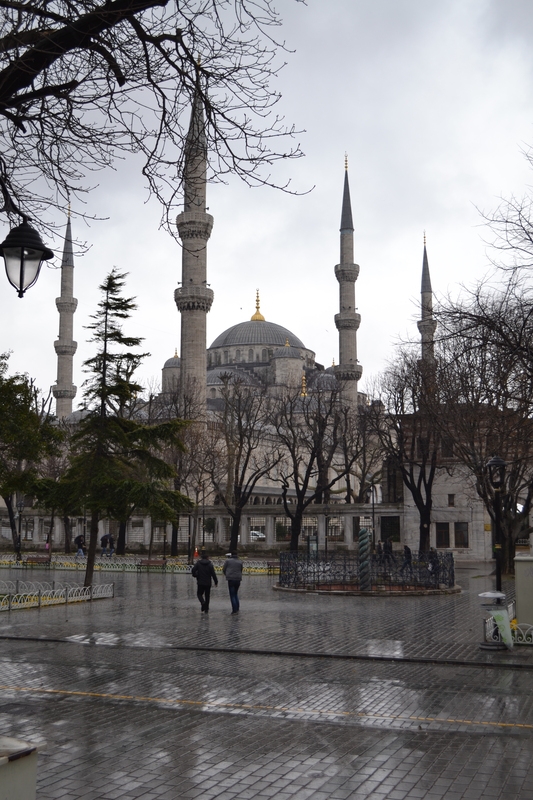 This entry was posted in Turkey and tagged Istanbul, Istanbul; Long weekend; travel; Europe; holiday; vacation, Middle East, travel writing, Turkey, Turkish bath, Turkish Lira, writing on March 5, 2013 by Rachel.